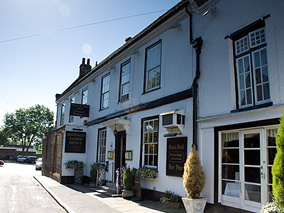 The Warren Lodge Hotel started life as a private house and the oldest parts of the hotel date from around 1700. However the most historic feature of the Hotel is the Mulberry Tree that dominates the garden. In the 16th Century, Cardinal Wolsey, the then Lord Chancellor of England, rebuilt Hampton Court Palace, which sits a few miles downstream from the Hotel. He ordered that Mulberry Trees be planted along the Thames so that, in season, he could always partake of his favourite fruit as he made his way up and down the river. Our Mulberry Tree is one of very few that still remain along the Thames and, although it is now definitely showing its age and has had to be supported in more recent years, it continues to bear fruit each year for our desserts. The oldest part of the Hotel is believed to have originally been used as a fishing lodge in the days when Sir William and Lady Hamilton lived at nearby Halliford House in the 18th Century. Lady Hamilton, of course, is famous for her subsequent relationship with Lord Horatio Nelson, the victor of Trafalgar and Great Britain’s finest admiral, who can be seen today standing on top of Nelson’s Column in London. Local legend has it that the Warren Lodge was used by Lord Nelson and Lady Hamilton (who was at the time still married) when they were courting. Love clearly blossomed and the story of their relationship remains one of the most famous love stories in British history. The Warren Lodge remained a private house for many years but subsequently became an Inn with a few bedrooms above. Later additions in the 1960s and 1970s created the large hotel that you see today. With the world famous Shepperton Studios just around the corner, for a time, the area was the Hollywood of Great Britain and countless British films and records have been made at the Studios over the years. As a result many world famous actors and musicians have stayed or dined at the Hotel from Laurence Olivier to Kirk Douglas and from Cliff Richard to The Who. As you walk around the Hotel take time to enjoy the history of the place. After all you may be walking in the footsteps of Cardinal Wolsey, Lord Nelson or even, the master of walks, John Cleese.